N, a good friend of mine who is a self-described “recovering corporate attorney who enjoys writing, traveling and the arts,” introduced me to veat when she brought Veat Makhani to a potluck dinner a few years ago. R and I were immediately hooked on her makhani dish and on veat. Veat’s a nice alternative when we’re trying to be paneer free and it’s quicker to cook than tofu because it goes straight from the freezer into a pan for a few minutes until it’s browned. 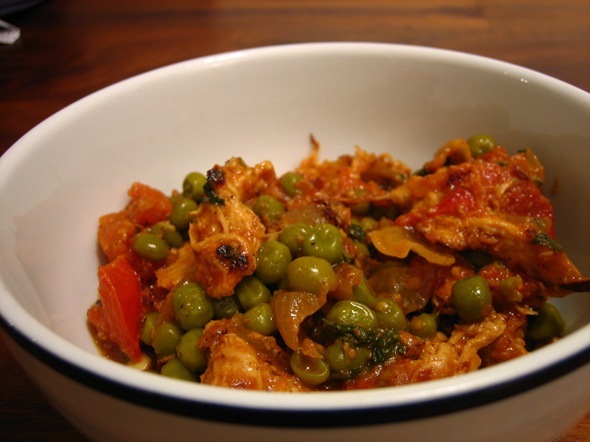 Veat’s a little meaty looking, so if you’re not into it you can easily substitute pan fried paneer or tofu. You can read more about veat in this post. Make the marinade by whisking yogurt until smooth and mixing in *2 tspn. of the tikka masala and ginger garlic paste. I bought my tikka masala spice mix from Kalustyan’s but you should be able to find it at any Indian grocery store. Put the marinade and the unchicken in a freezer bag and let marinate for at least 30 minutes. Then pan fry the unchicken along with the marinade in a skillet with about a tablespoon of oil until well browned. Heat about a tablespoon of oil in a separate skillet. Add the onions and cook until translucent. Add the tomatoes and cook on medium heat until the tomatoes start to “melt.” Mix in the peas and remaining 1 tspn. of the tikka masala. Cover halfway and cook for about ten minutes. Mix in the unchicken along with any remaining marinade and sprinkle with lemon juice and salt. Cook uncovered for another ten minutes. Garnish with chopped cilantro. Enjoy with naan and a side of raita or over basmati rice. I’ve gotten a lot of questions about some of the spices I’ve used in recipes. I’ve decided to keep a running Masala Rack log of the spices I use. It’s going to be linked to above in the top bar and will hopefully become a useful resource about Indian spices. Please feel free to add any insight about the spices in the comments. *Update: not all tikka masala powders are created equal meaning some brands can be much spicier than ours. Despite Kalustyan’s being labeled “Extra Hot” I found that we needed 3 tbspn. to get the right amount heat. 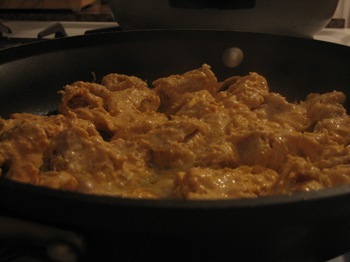 If you aren’t sure how spicy your tikka masala powder is, I would start with 1 1/2 tspn. in the marinade. You can always sprinkle more on top at the very end if it’s not as spicey as you wanted…always easier to increase the heat than to decrease (which I would do by sprinkling a few pinches of sugar in at a time). This dish seems to be good substitute for vegetarians. Specially,when vegetarians donâ€™t get much of proteins in their diet. Thanks for checking out my blog and for the comment! That’s a great point – According to Veat, a single serving of veat bites provides over a quarter of your daily protein needs (8g protein in a 2.5 oz serving) and May Wah’s seems to have twice as much per serving (15g in a 2.5 oz serving). Great photograph. Dish looks good too. Just stumbled upon your site. I really admire all the time and effort you have put into this. I guess I will make this a reference point anytime I am looking for a vegetarian recipe. since i like to gain knowledge of moree aand more.